Our family loves potatoes. My late father-in-law was a distinguished physician but it was remarkable how many of the sympathy letters we received after his death, regardless of whether they were talking of his career or his kindness, also recalled fond memories of going down the garden with him to dig potatoes. It must be hereditary. Given a choice between pasta, rice and spuds, my husband will always opt for the latter. So I was very happy to be given a copy of Jenny Linford’s new book, Potatoes, published by Ryland, Peters and Small on October 9. Jenny is a fine food writer and I trust anything that comes from her pen and her kitchen. The book covers everything from history to farming but above all it’s crammed with recipes for this cheap, nutritious and well-loved ingredient. There’s everything from traditional favourites like triple cooked chips (who doesn’t like chips? ), potato cheese pie and Lancashire hotpot to Malaysian chicken and potato curry, Persian-style saffron rice (with potatoes), pierogi, Jansson’s Temptation, potato chaat masala and kimchi potato cakes. The recipes demonstrate the versatility of the humble spud as well as the affection in which it is held by so many different cultures. As Jenny says in her introduction to the book, there’s a friendly quality to the potato. I particularly like her hasselback potatoes with parma ham, the Indian five-spice sauteed potatoes, the potato coriander pakoras and the seaweed butter potatoes. 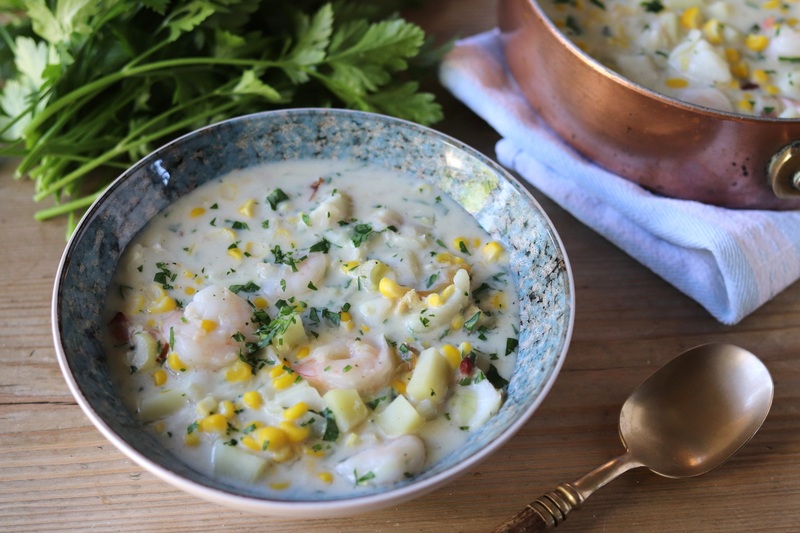 But it was Jenny’s recipe for cod, sweetcorn and prawn chowder that really caught my eye, as I’d been planning to make something similar and had ingredients handy. It’s a lovely main course soup, gentle, creamy and comforting. I reproduce it here with permission. In a large, heavy-based saucepan, fry the bacon, stirring, for 2 minutes. Add in the butter and once it foams, add in the onion and celery. Fry gently for 2-4 minutes until softened. Mix in the flour, stirring in well, and fry briefly. Gradually stir in first the milk, then the fish stock. Stirring, bring to the boil and cook until thickened. Add in the diced potatoes and simmer for 5-10 minutes until tender. Season with freshly grated nutmeg, salt and freshly ground black pepper. Bring to the boil, add in the cod or other white fish and sweetcorn and simmer for 3-5 minutes until the fish is cooked. Add in the prawns/shrimp and simmer for 2 minutes. Stir in the parsley and serve. This entry was posted in Fish and shellfish, Mains and tagged cod and sweetcorn chowder, Jenny Linford, main course soups, potato recipes, Potatoes by Jenny Linford, the humble spud by Linda Duffin. Bookmark the permalink. 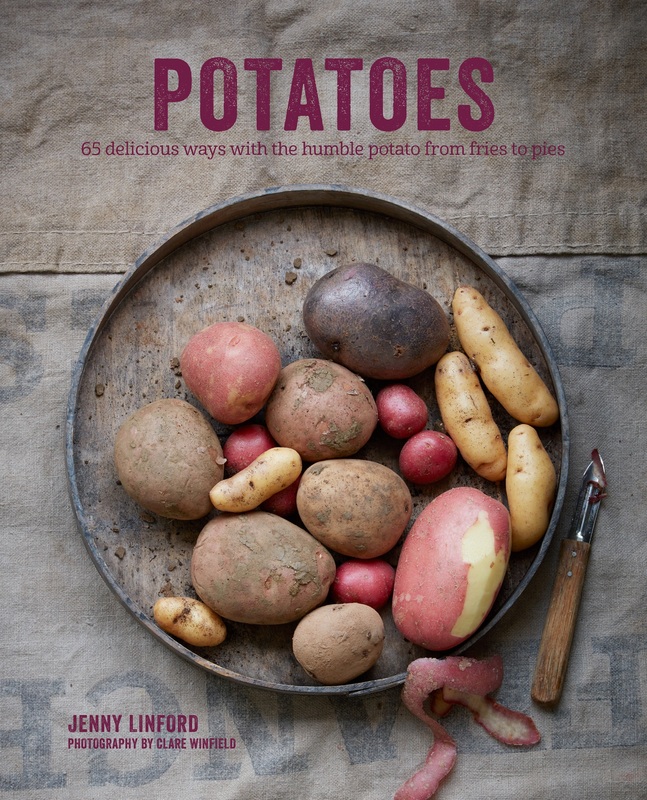 As a fellow potato lover, I say thank you for introducing me to Jenny Linford’s new book Potatoes. It’s now on my Christmas wish list. As for the chowder, it’s sounds like pure comfort in a bowl and a recipe I must try. Hi Ron, thanks, I’m sure you’ll enjoy the book. The chowder really is lovely. Thanks for stopping by! Ahh. A recipe from the venerable Mrs. Portly for which I do not need my metric converter. We are surrounded by potato farms so this book is a must for us. Thanks for the tip. Haha, yes, the book covers US and UK measurements. Do you think I’m being lazy in not giving the alternatives usually? I used to do metric and imperial but I’m a bit wary of giving cup measurements in case I get it wrong! That looks lovely. But I bet your hisband wouldn’t like the wartime recipe I glanced at this morning for date, honey and potato cake – main ingredients flour, mashed potato and dried egg. Yummm. Dear heaven, that sounds grim. Mmmmmh the chowder sounds delicious~! Hubby’s away on a business trip for a couple of days, so I actually have several as-of-yet-unplanned dinners that could be filled with something deliciously seafoody and comforting like this 😀 thanks for sharing~! great food: I do not cook them often and every time I am surprised how good they are, even simply steamed and dressed with butter or oil. we do not have many potato dishes in the Italian repertoire, but one is one of my favourites: a potato pie, filled with ham/mortadella, cheese, mozzarella chopped eggs: it is called Gattò di Patate and ti comes from Naples (I think I might have the recipe on my blog/cannot remember)… one of those comforting, rich, unctuous dishes…. Lovely recipe and presentation Linda. We eat plenty of them here and I do try to spread it about a bit with rice, pasta, polenta etc. However, a good potato is a glorious thing. Thanks, Conor, I think a lot of people will enjoy Jenny’s book. We really enjoyed this chowder. I snuck a bit of smoked fish into it as well, which worked beautifully. Potatoes are great at soaking up flavours.